Newfoil Machines Limited was founded in 1982 and has gone on to become world leader in the field of roll fed hot foil label printing machines and converting machines, having over 1500 installations in over 90 countries worldwide. From the launch of the first machine at the 1982 Label Expo exhibition in Birmingham, U.K, the range of machines and options has been continuously developed and expanded. Our equipment is now regarded as the industry standard for high quality finishing and converting. This evolution has culminated in our Servo range of presses. The new machines use the latest development in servo technology, the “integrated motion and safety control” system. This brings together the various dynamic and control elements of the machine into one package. Using the HMI touch-screen control panel, the operator can set-up and optimise the label parameters in a minimum amount of time and store the data for re-use. All Newfoil machines are designed and built at our 2,000 Sq metre factory, in the United Kingdom, this modern facility is equipped with the latest CAD design systems, CNC machine tools and production equipment. In-house production accounts for 95% of the machines engineering content and the advanced Servo control system is supplied by of one of the market leaders in motion control technology. Having total control of the manufacturing process enables Newfoil Machines to enjoy an unrivalled reputation for reliability and quality. In terms of equipment, Newfoil Machines offer a wide range of presses; from the 2500 with one printing and one die-cutting station each with a print/cut area of 160mm x 160mm. Through to the model 5534 with two printing and one dies cutting station with print/cut area of 310mm x 270 mm. 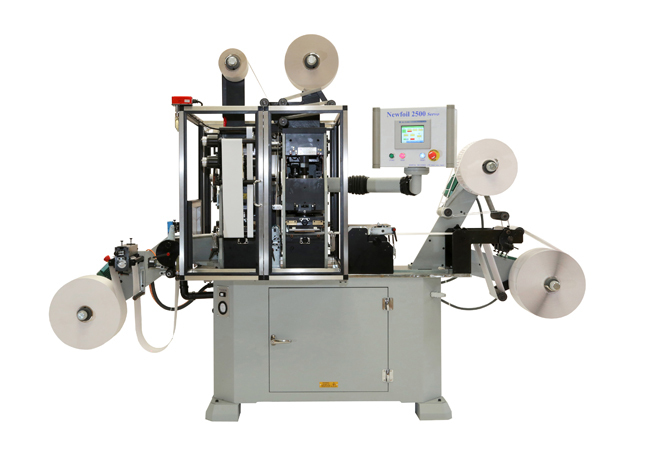 The machines are designed to meet the needs of in-house label printing operations through to the large commercial label printing houses. The complete range of presses from Newfoil Machines have the unrivalled ability to die-cut labels in polyester, polycarbon, kapton, polycon and other difficult substrates. In addition, by laminating and die-cutting in-line, the need for expensive pre die-cut labels and multiple passes through different machines is eliminated. Any damaged or imperfect labels can be recognized and rectified immediately, without excessive waste, thereby reducing overall label costs. Short to medium runs can be produced economically at point of use for immediate application, no inventory, no minimum quantities and no surplus stock. These machines are ideal for end user applications, such as pharmaceutical, cosmetics, chemicals, electrical and electronic goods manufacturers. Being essentially an engineering based company, meeting the criteria for special design projects is standard procedure. Custom designed and built machines account for a considerable amount of the company’s activities. We at Newfoil Machines pride ourselves on innovation and research; We have found that this is an excellent route to advance our development within the roll label industry. The latest additions to the Newfoil range are the 3534 and 5534 model. These machines have been designed to meet the demand for a wider web machine to be compatible with the increasingly popular digital printing systems. They have a web width of 340mm and can be supplied with free standing unwind, rewind units with 800mm diameter capacity. To complement the 340mm wide machine two additional pieces of equipment are offered. U.V. flexo coating and spot varnishing in register is possible using the Newfoil SF330. This machine is designed to run in line with a Newfoil Servo machine to convert and finish digitally printed webs from HP, Epson, Xeikon etc. Screen printing using the flat bed method is now part of the Newfoil range. The screen size is 340mm X 460mm, U.V, I.R and turbulent hot air drying systems are offered. The digital servo system with “Integrated control and safety” is used throughout the Newfoil range ensuring compatibility and interchangeability.